Micromax A075 phablet is now official on company’s website, the handset comes at reasonable price although the specs are not very impressive. The handset comes with DUAL SIM support with Dual Standby, but lacks the 3G network support. The handset appeared on HOME SHOP 18 last week and now it is listed on company’s official website. The Micromax A075 packs with a 5.2 inch 480 x800 pixels display and 1.2 GHz dual core processor paired with 512MB of RAM. It has 4 gigs on internal storage ( ROM ) and up to 32 gigs expandable memory via micro SD card support. It has 8-megapixel primary shooter with LED flash and a 0.3-megapixel secondary shooter. The battery of the phone is 2200mAh, which would be enough for such screen size. It would compete with other mid range smartphones available in the market. The A075 is 10.8mm thick and weighs 225 grams. Home Shop 18 is also offering Freebies with the Phone, like Snap cover of RS 1499 and free Gaming content of RS 1999. Micromax A075 offers 2G, WiFi, Bluetooth, GPS and FM radio connectivity. To make the hardware run there is Android 4.0 ICS operating system, which is quite outdated now days. 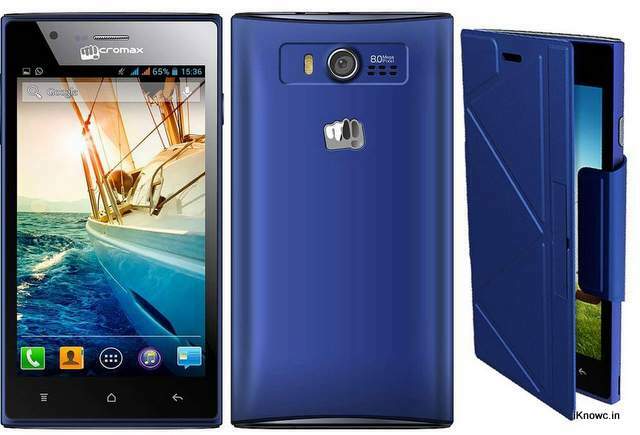 It is available in Blue color and is priced at RS 6499.